As you know, the open stance forehand allows for more power and quicker recovery to the next ball; however, the loading and rotation associated with the open stance forehand places the hip at risk of injury. So what can you do to reduce the risk of hip injury? Tennis players who stay healthy and hit the biggest strokes have the ability, strength, and coordination to stabilize the body in order to deliver a powerful force sequence into the ball. This week, we will focus on exercises that build strength in the muscles on the outside of the hip – muscles that provide stability for your strokes and also help with lateral movement on the court. All you need is a piece of elastic band or “mini band” to get started. Perform 2 sets of 10-15 repetitions for each exercise 2-3 days/week. If you feel like you are unsteady or losing your balance with the standing exercises, then be sure to use a chair or post for support. These are easy to do at home, at the gym, or at the courts. Try incorporating these hip exercises into your weekly tennis routine. These exercises not only minimize the risk of injury at the hip, back, and knee, but can improve mechanics and performance so you can play better, healthier tennis in in 2015. Check out how the pros take care of hip health on the ATP tour! 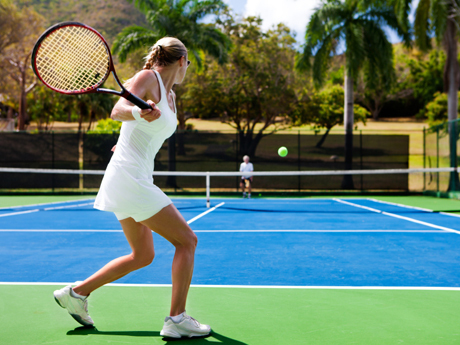 Be sure to stay tuned for our next week’s blog on tennis technique and injury with your favorite local tennis pros!